If filmmakers want to keep their audiences hooked, then they've got to hit them right off the bat with an incredible intro. That's especially important for an action movie. After all, it's a genre of gunfights, fisticuffs, and car chases, so fans are expecting excitement — and fast. That means the movie has got to start off with an explosion of action-packed awesomeness and never slow down. Whether you're introducing your characters in the most badass way possible or tossing moviegoers directly into a firefight, it's all about making sure your audience is dying to see what kind of crazy spectacle will happen next. And the films that succeed with their first few minutes often get to live on in the bullet-riddled, blood-stained halls of action film glory. From costumed gangs gathering in the streets to automobile moves that would make a NASCAR driver nervous, these are some of the greatest opening scenes in action movie history. Opening credits can do a lot more than just introduce the cast and crew. They create a mood for the audience, introduce the world of the film, and get expository info out of the way so the rest of the movie can focus on the action. And when it comes to The Warriors, director Walter Hill wastes no time in setting up the stakes from the very first frame. As the credits start to roll, Barry De Vorzon's electric theme starts driving the pace, letting us know tonight is going to be one wild ride. 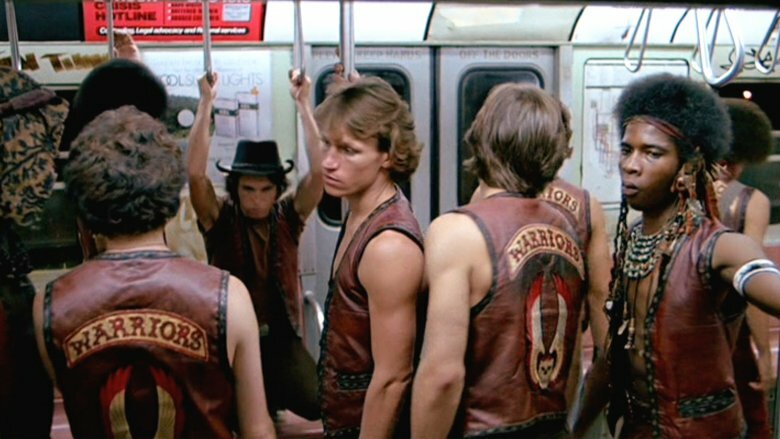 Hill immediately introduces us to the titular gang — in all their leather-vested glory—waiting for a Coney Island subway. This is where the Warriors call home, but things are uneasy tonight under the lights of the Wonder Wheel. With just a few snippets of dialogue, we listen as the Warriors talk about what's going down in the five boroughs. Every gang in New York is headed to the Bronx to meet a messianic figure named Cyrus. Everybody is supposed to play nice for one evening, and that means everyone is supposed to leave their weapons at home. The way Hill drops all this info is so economical. He even cuts to a subway map to show us the Warriors are about to find themselves far from their Coney Island turf. And as our ragtag heroes plan their odyssey to the Bronx, Hill cuts to shots of other colorful gangs headed to the summit. We're introduced to the Saracens, the Savage Huns, and the Electric Eliminators. We've got mimes, camouflaged militants, and super fly guys with purple fedoras. In just six minutes, we've met our main characters, we understand the stakes, and we've got a feel for this fantasy world. So when the truce is broken and things get crazy, we're already primed for what's going down. Can you dig it? What's the greatest opening scene of all time? Sure, there's the Rebels trying to outrun the Empire in Star Wars and the thrilling bank robbery/Joker reveal in The Dark Knight. 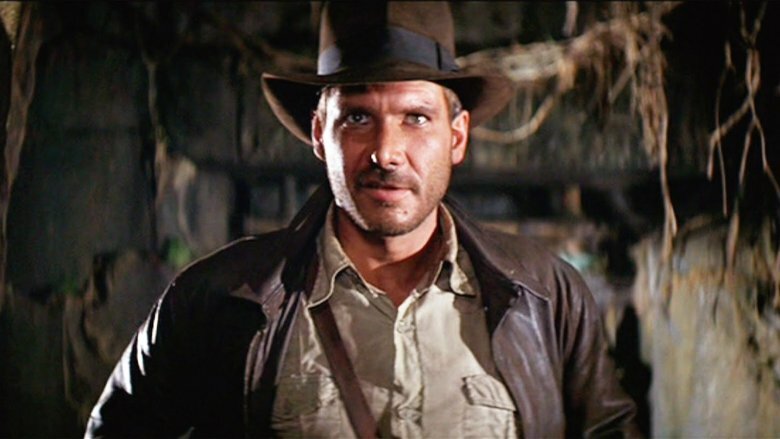 But if we're handing out a little gold idol… er… trophy for the best opening in cinematic history (let alone action movie history), we're giving that award to Raiders of the Lost Ark. After the Paramount logo dissolves into an actual mountain, director Steven Spielberg plunges viewers into a world of old-timey serials and Saturday morning adventures. A mysterious guide leads two treasure hunters into a rainforest filled with scary sculptures and poisoned arrows, and when one of the explorers tries to put a bullet in his back, the guide whips the pistol out of his hand. And that's when this enigmatic adventurer steps out of the shadows, giving the world its first good look at the stubbled visage of Indiana Jones. But it's when Jones steps into a hidden temple that you really know Raiders is going to be special. 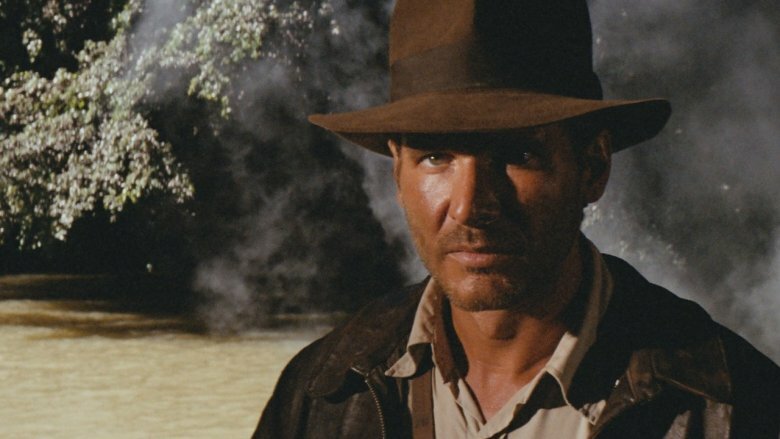 The place is filled with giant spiders and nasty booby traps, and when Indy snatches up a priceless idol, he's forced to flee from the world's most famous boulder. It's one setback after another, and even when Jones makes his way outside, he finds himself face to face with his arch-rival and an army of very unhappy natives. And while this classic opening is non-stop action, it teaches us everything we need to know about Jones. He's a man of action, and he's a problem solver. He's a little cocky, and every so often, he screws up royally. Most importantly, this guy can face arrows and arachnids, pistols and deep, dark pits, and nothing at all can faze him… except for a little old snake. Directed by Kathryn Bigelow, Point Break is about two dudes who might love each other or might end up killing one another in an extreme sports showdown… or both. On one side of the law, you've got Johnny Utah (Keanu Reeves), the ex-jock turned FBI agent. On the other, you've got Bodhi (Patrick Swayze), the zen surfer who spends his days riding waves and robbing banks. Eventually, these two are destined to collide, and when they do, they're going trade bullets, beliefs, and some romantic tension. But before Utah and Bodhi cross paths, we get to see them in their own worlds, each man doing what he does best. 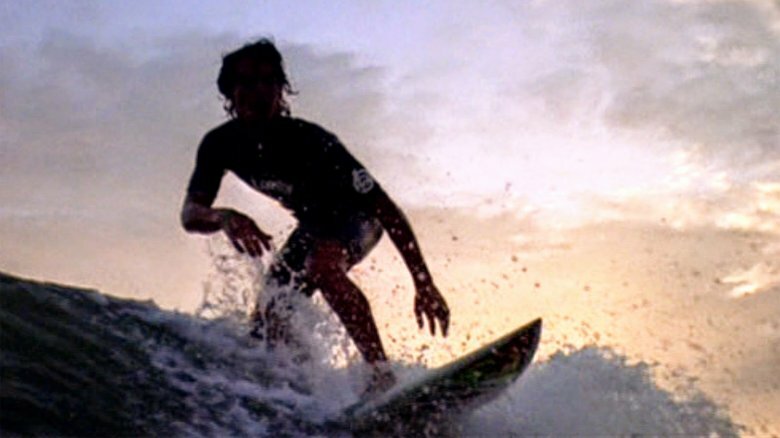 Point Break opens with Bodhi in complete control of the ocean, looking like a Greek god as he slides across the swells. But as Bodhi moves in slow motion, we cut to Johnny Utah, standing in the rain with a shotgun. He's getting drenched, but that can't slow this sniper down. The FBI rookie is blasting target after target at a shooting range, picking each one to pieces. (That's something that might come into play later on.) As Utah fires and Bodhi surfs, Bigelow cuts back and forth, showing each guy in their element, each man absolutely soaked with H2O. It's Big Brother and the dude bro, and eventually, these two will surf into each other's lives and wind up in the ultimate showdown — and the ultimate bromance. It's easy to forget nowadays — largely thanks to the inferior sequels — but when The Matrix came out in 1999, it was a pop cultural force to be reckoned with. The movie spawned a host of imitators, popularized bullet time, and created memes that live on to this day. And it was all kickstarted with, well, a kick. Directed by Lana and Lilly Wachowski, The Matrix opens with a wall of digital rain and a mysterious conversation between two unseen people about somebody called "The One." That's when the cops show up, moving down an abandoned apartment hallway and busting down a door. On the other side sits Trinity (Carrie Anne-Moss), clad in shiny black leather and ready for a showdown. We don't know why the police want her, but we quickly find out they're never going to catch her. 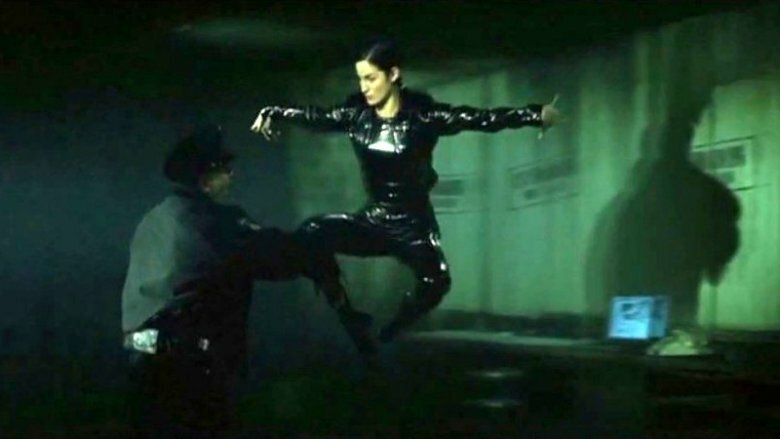 When a cop brings out the cuffs, Trinity leaps into the air, the camera swings around, and time stops for just a moment, long enough for us to revel in Trinity's badassery. She's frozen there for a second, and then comes the kick, launching the cop across the room. Moments later she'll run up a wall and then leap across a city street like she's some sort of hero, all before mysteriously disappearing inside a telephone booth. Audiences were hooked from scene one, and the Wachowskis owe a major debt to Carrie Anne-Moss for kicking their film off in the right way. 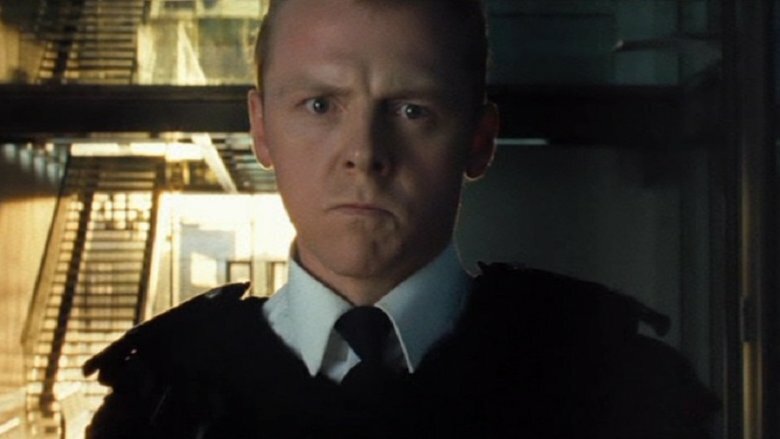 Directed by Edgar Wright, Hot Fuzz works on many levels. It's a brilliant comedy, a slasher film, and a fantastic satire of Michael Bay-style action movies. But while it pokes fun at Point Break and Bad Boys II, it's also a solid action flick that revels in the joys of badass 360 shots and images of guys flying through the hair, Glocks in each hand. Sgt. Nicholas Angel, on the other hand, absolutely hates all this action movie foolishness. Played to serious perfection by Simon Pegg, Nicholas Angel has no time for fun and games. The man is all about bringing down bad guys the proper way. When we first see Angel, he's marching straight towards the camera, all purpose and no nonsense. His stony expression perfectly matches the photo on his ID, and as Martin Freeman's narration kicks in, we discover that Angel is the world's greatest cop. In a rapid-fire montage, we watch as Angel takes on rioters, brings down drug dealers, and survives an unwelcome gift from Father Christmas (Peter Jackson). We learn he's an expert at everything from cycling and judo to the 100-meter dash. And when he's not beating his teammates at chess and fencing, he's putting them to shame in the streets by racking up the highest arrest record for any officer in London. He's brilliant in the classroom and beloved by the community, and through it all, he never cracks a smile. He's the perfect police officer, and the whole opening montage is a fantastic setup for seconds later, when Angel is kicked off the force…for being too perfect. Quentin Tarantino knows how to get a movie going. Reservoir Dogs opens with that snappy diner conversation, Kill Bill starts with a bloody Bride begging for her life, and Django Unchained begins with a musical blast from one of the best spaghetti westerns ever made. But Inglourious Basterds puts them all to shame by introducing one of Hollywood's greatest villains: Col. Hans Landa. 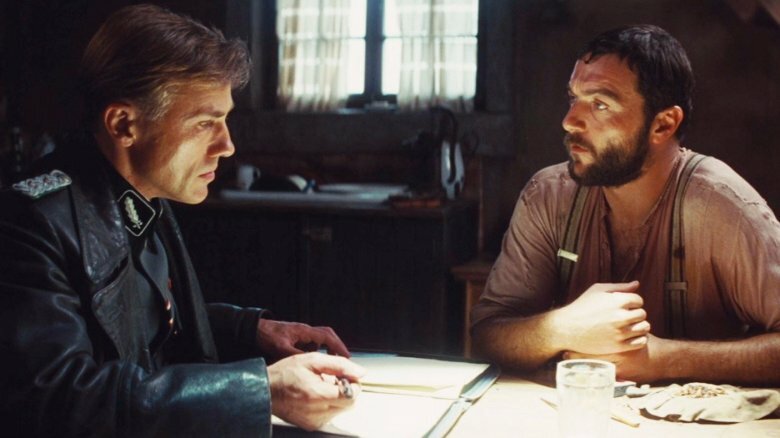 What follows is one of the most suspenseful scenes ever put to film, as Landa sits across from a nervous French farmer and begins playing "mind games" with the guy. Landa lectures on rats, smokes a Sherlock-on-steroids pipe, and makes little power plays to remind the farmer who's calling the shots. The whole thing is incredibly tense because we know there's a Jewish family under the floorboards, and Landa is pressing and prodding, trying to make the farmer confess he's hiding them. Landa starts the interview as a paragon of politeness, but soon the charming light fades from his eye, and the SS officer kicks into gear. After forcing the farmer to reveal the truth, Landa has his men blast the floorboards to bits with their machine guns. Shosanna Dreyfus (Melanie Laurent) manages to escape, but only because Landa lets her go with a cheerful au revoir and horrific smirk that you wish somebody would slash off his face with a Bowie knife. Directed by Steven Soderbergh, Haywire starts in media res, with a mysterious woman named Mallory Kane (Gina Carano) walking into a middle-of-nowhere diner. It seems like she's ready for a quiet morning with a cup of coffee until a car pulls in the parking lot and out walks Aaron (Channing Tatum). We don't know anything about this guy, but he immediately slides into Mallory's booth and smiles a weary smile before telling her to get in his car. When she says no, the two start squabbling like they're a married couple teetering on the edge of a knock-down, drag-out fight. See, Mallory Kane isn't some tourist wandering around upstate New York. She's black ops agent who's been set up by her boss, and Aaron is the guy who's supposed to bring her in. At first, it looks like Mallory might be able to talk herself out of the situation… until Aaron throws a cup of scalding hot coffee in her face. In action movies, you don't often see women getting pulverized, but Tatum smashes a mug over her head, slams her to the ground, and starts violently pounding away on her face. But hey, this is Gina "Conviction" Carano we're talking about. After a nearby patron drags Aaron off for a moment, Mallory swings into MMA mode, sweeping her much bigger opponent off his feet, laying on a tight armbar, and pistol-whipping Tatum's face until Magic Mike doesn't look so magical anymore. And all this is just five minutes into the film, which means the rest of this martial arts spy thriller will be a truly haywire adventure. The main reason people watch Mission: Impossible movies is because we love seeing Tom Cruise put his neck on the line for our entertainment. Whether he's scaling the Burj Khalifa or dangling from a helicopter, this is cinema at its most exciting, and Rogue Nation wastes no time throwing Cruise in harm's way. Directed by Christopher McQuarrie (who also directed follow-up installment Fallout), the fifth film in the series begins with our IMF heroes trying to stop a group of Chechen terrorists from boarding a plane and taking off with some serious chemical weapons. When Benji (Simon Pegg) and Luther (Ving Rhames) fail to shut the craft down remotely, Ethan Hunt (Cruise) springs into action by jumping onto the side of an Airbus 400 as it's lifting off the ground. As the plane rises higher and higher, Benji frantically tries to open the door from his laptop so Ethan can safely get inside. But while he scrambles to save his pal, Ethan is hanging on for dear life and trying not to look down as he leaves the Earth further and further behind. 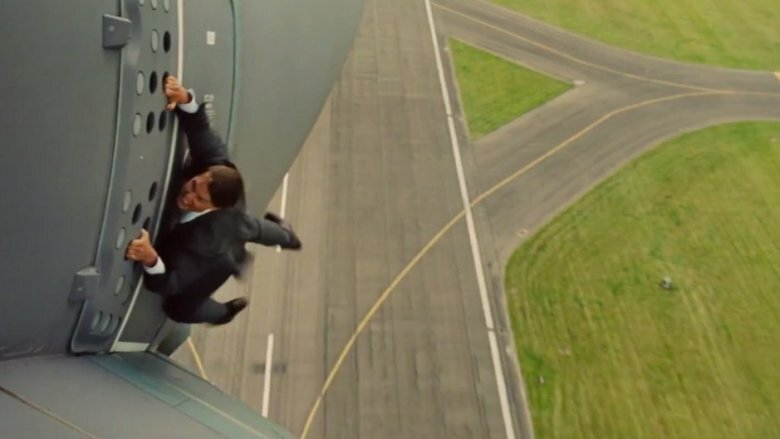 And of course, that's actually Cruise hanging on the side of that plane. Sure, he's wearing a harness and special contact lenses to protect his eyes, but come on. He's still on the side of an airplane that's about 5,000 feet in the air. It's an adrenaline-filled opening to one of the best films of the franchise, and a scene that took Cruise's career to new heights. 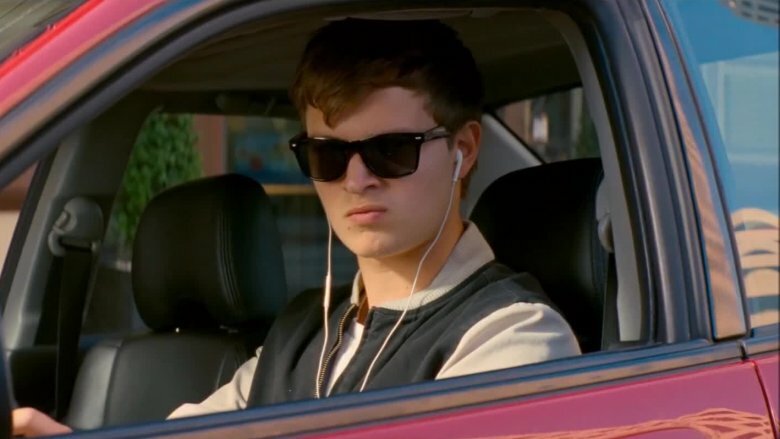 Mix a musical with an action movie, and you'll get Baby Driver, a 2017 heist thriller about a getaway driver named — you guessed it — Baby (Ansel Elgort). This kid is a "Mozart in a go-kart," but as he suffers from terrible tinnitus, he drowns out the noise with an incredible collection of rock tunes and pop songs. Grooving to tunes is the only way he can focus on the road, and as a result, his every move is lined up with the music. Director Edgar Wright wanted to establish this musical tone from the beginning, and as soon as that red Subaru pulls into frame, Baby cues up the Jon Spencer Blues Explosion. Blaring "Bellbottoms" from his iPod, Baby dances and lip syncs along with the song, playing drums on the steering wheel and singing into a water bottle like it's a plastic microphone. His windshield wipers rock back and forth to the beat, and Baby is absolutely in love with the song. But he's also very conscious of the moment, as his three black-coated cohorts are currently robbing a bank. The trio of gun-wielding thugs move in time with the music, and when they come running back to the car, it's time for Baby to earn his well-deserved paycheck. With "Bellbottoms" scoring his escape from the cops, Baby swerves up and down the streets of Atlanta, using every trick up his jacket sleeve to escape from the police. And what's impressive is that pretty much every stunt you're seeing is real, including that staggering "180 in, 180 out" spin Baby uses to maneuver down a crowded alleyway. It's a pulse-pounding sequence, one that gets you rooting for this kid from the very beginning, and it does a fantastic job of setting the tune for the rest of the film. Going into Casino Royale, a lot of fans were skeptical about Daniel Craig as James Bond, especially when it came to the man's looks. (Sound familiar?) So the film really needed to make a good impression as soon as possible. It was also essential that the movie let audiences know they were in store for something new. This wasn't Pierce Brosnan in Die Another Day. This was Bond in the age of Jason Bourne, so the movie needed a killer opening to the introduce the world to a new and brutal 007. 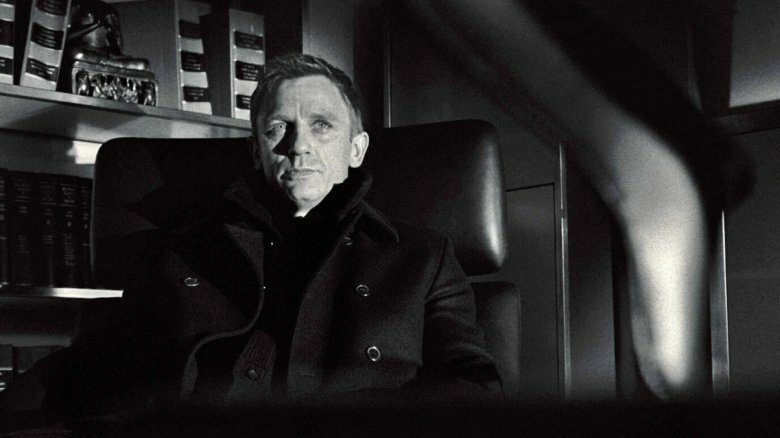 Shot in gloriously cold black and white, Casino Royale starts off with the birth of everybody's favorite debonair spy. Only this time, he's not worried about sipping Martinis — he's got murder on his mind. Granted, Bond isn't a 00 yet, but he's just two kills away from becoming one of Britain's best agents. We watch as he savagely destroys an enemy spy, beating the dude to a black-and-white pulp before drowning him in a bathroom sink. Roger Moore would never dare do something so uncouth. This is a Bond with ice in his veins. This savage kill is played as a flashback, intercut with scenes of Bond in the snowy city of Prague, confronting a backstabbing section chief. And as you've probably guessed, Bond isn't here for a round of idle chit-chat. At first, the traitor thinks he's in control of the situation, and even pulls out a gun. Too bad that Bond already removed the bullets. This is a spy who's always two steps ahead (well, usually), and after firing one clean shot, we know killing enemies in cold blood is no big deal for this Bond.